Suit up as this authentic comic book character that can leap buildings in a single bound. 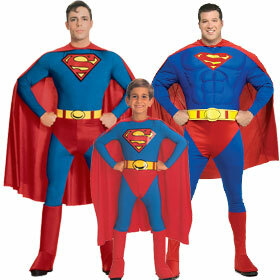 The original boy from Krypton will be a sight to be seen this Halloween. Christopher Reeve made the ideal Clark Kent. It�s easy to be an extra terrestrial Hercules. 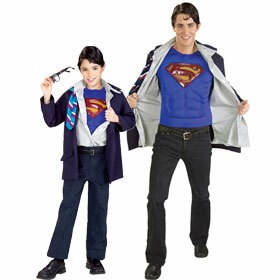 Look like a real Superman at the next holiday party to drive the kids wild. 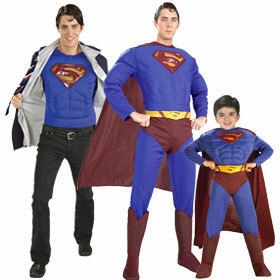 Join the Justice League of America as the new guy in blue tights. Rush into a phone booth and rip off your work shirt. Take to the skies with that iconic S logo emblazoned on your chest. 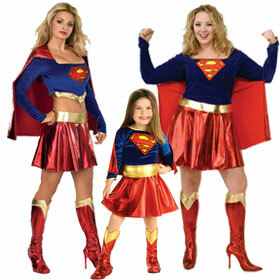 Team up with those superhero best friends, Batman and Wonder Woman, for a high flying night on the town.